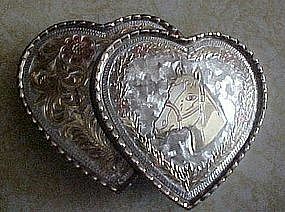 A very pretty double heart belt buckle with a horse head. Silver and gold coloring, marked W.USA. Cut designs and western scroll pattern. No marks to indicate it is real silver. Measures 2 5/8" x 3 1/2". Used but Nice! !